Online registration for "GO GO for the Gold" is now closed. Tickets can be purchased at the door. YOU could win $10,000 in gold at this exciting event! boogie on down to the GROOVIEST shindig that Southeast Texas has ever seen! For the ticket cost of $100, participants receive admission, dinner and cocktails for two along with one entry into the most exciting drawing in town. Three lucky ticket-holders get a chance to win unbelievable prizes in gold, magically turning $100 into $10,000 for the first place winner in a reverse drawing where the winner is the last ticket drawn. The second place winner receives $1,500 in gold, and third place winner receives $1,000 in gold. 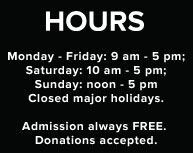 Proceeds from Go for the Gold benefit the museum’s exhibitions and education programming. Tickets are limited, so purchase yours now by clicking “register” on the left. For more information, call (409) 832-3432.